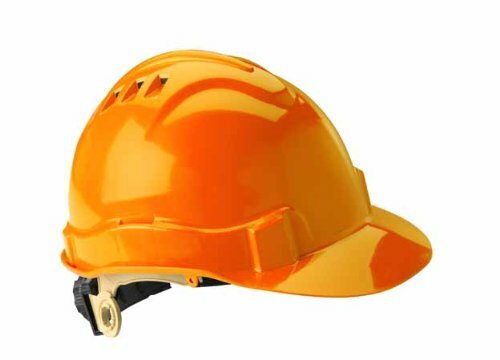 Gateway Safety Serpent, Class C high-density polyethylene safety helmet is a durable, vented hard hat that is ideal for hot or humid work environments. The sleek, attractive style of the Serpent safety helmet will lure you in, but won’t turn you into stone. Serpent protects against the most threatening of hazards, and has been independently tested to meet the voluntary ANSI Z89.1-2009 standards for high visibility to prove it. It may not turn victims into stone, but Serpent will work powerfully to defend against head injuries. Rotating ratchet adjustment system helps keep the helmet securely in place. Workers will be compelled to keep Serpent on because of its many comfort features, including an eight- point, six-strap suspension, a soft cloth brow pad that absorbs moisture, and an ultra-light weight of just 13 ounces. Vented shell allows heat to escape, keeping workers cooler on the jobsite.